Since the terrible chemical spill into the Elk River in West Virginia on Thursday I have watched 300,000.00 of my states citizens suffer unheard of problems from just the simple lack of clean water. The chemical that my southern friends are exposed to are toxic enough to not only made the water undrinkable for humans or animals it made the water unsuitable for even washing your clothes, bathing, or using it for any thing. This man-made disaster could have had to potential to have killed thousand of plants, animals and humans. Yet the biggest problem the my family and many others have been discussing is that people are not even close to being prepared to care for their families if this was to happen to their town. FEMA suggest that every person should have at least 3 gallons of water per person for at least a total of three days. This would mean that my family of three should have stored about 9 gallons of water per person stored for an an emergence like this. How many of us have that amount of fresh usable water on hand? I would not call my family a prepping family.. .. just a county family that knows what being self-reliant is about. We know what it like to not see a snow plow for days on end and some times never. We know what it is like to go with out electric for weeks in the cold winter and in the heat of summer. We know that every time the electric goes out you have no running water; no electric means no pump, that means no water. So from just our everyday lives we think ahead and store what we can so that we can live comfortably for about a week with out electric, water or even leaving our drive way. 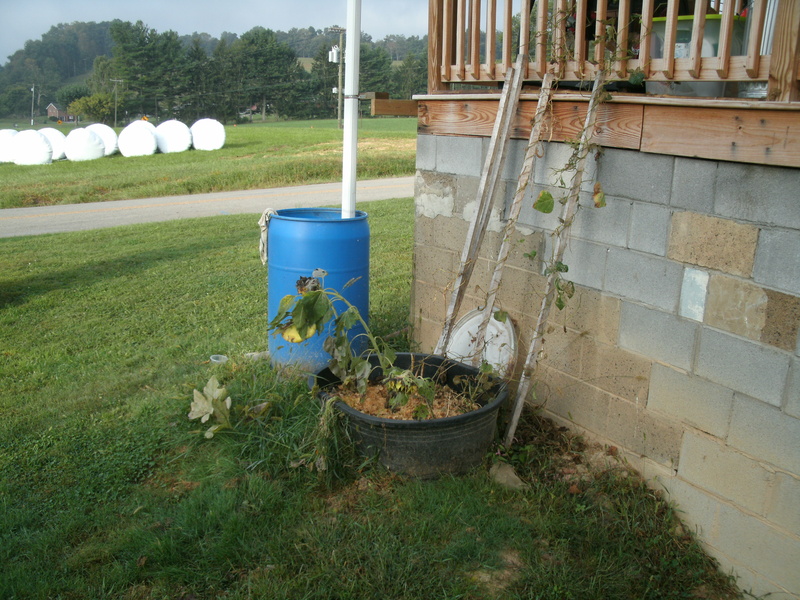 Tip # 1 one of the least expensive ways to store water in large qualities is a simple rain barrel. I have had them for years and at every home that we have lived in. I think I spent about 17 dollars on the barrel and maybe 10 dollars on Quick dry cement for the level pad it sits on. Then the rest is free. Their you go at least 50 gallons of water for almost no money. Our barrel has a spout kit on the other side so that I can use the barrel for watering my flowers and vegetables. The tap did add about 6 dollars and a little time to install to my barrel. We do not try to cover our barrel so we can use a bucket to carry the water into the house or out to bird bath it also allows for the water to expand in the winter when it freezes. But think this water could keep my family safely washing dishes, taking baths, flushing the toilet and giving my pet safe water to drink for days. In a real pinch we could even sanitize this water for drinking. There are hundreds of rain barrel ideas all over the internet and huge storage systems that people build that enclose the water and run through filtering systems that can make rain water drinking safe if you want to go that far. We just want to know that we can flush the toilet and wash our bodies when the time comes. 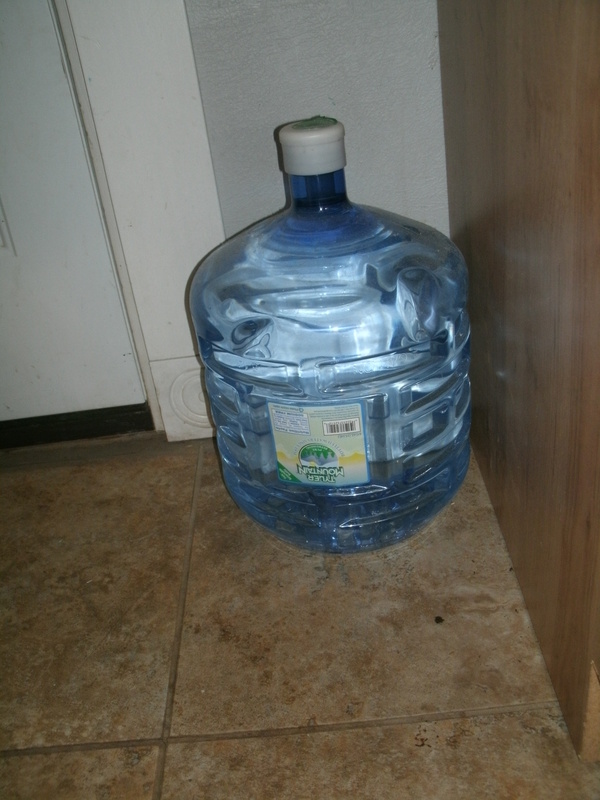 Tip # 2 Tom and I also store water in our kitchen and basement in these 4 gallon bottles of water, the one below is the one that I always keep in the kitchen in case we need water for cooking and I am to lazy to go to the basement to get it. We found these at local Kroger store with a refilling machine outside on the side walk.The cost per bottle may vary and may have gone up since I bought these but I think they were 6$ each with a refund of .99 cents every time you recycle the bottles for a refilled… I have never refilled the 4 that I have so the prices maybe different. So that is 12 gallons of cooking and drinking water in large bottles, used mostly for dishes and making tea. Tip # 3 Everyone should try to store at least one case of bottled drinking water per person in their house hold.We keep at least 3 in our basement at all times, in the summer there is always some in the truck for Tom, in the fridge and in the kitchen… usually two more cases in the summer. For our family 3 to 4 bottles of water for drinking a day plus some for teeth brushing and hand washing is about all we really need so a case could last at least two days with three cases we have about a weeks worth for every person who lives in my home. Tip #4 There are other item that is handy to have around to keep water safe and clean. The most important and least expensive is a simple bottle of bleach. As we all know from being kids at swimming pools chlorine bleach kills lost of nasty bugs in water. If I had to depend on my rain water for cooking, or washing dishes where the water temps were to low to sterilise the water 1/8 of a teaspoon of bleach will kill enough microbes to safely use the water for washing dishes, bathing, and cooking at high temps. It is even recommended by the CDC for use in drinking water if you are unsure of the water coming out of your tap. I try to always have a small bottle around for other uses as well. Never know when you are going to need to sanitize an area and this works great in a spray bottle or in a water wash. Tip #5 Just in case you just cant get enough water to say take a bath or wash you hands. Lysol wipes, Wet Ones, Clorox wipes or any anti bacterial wipes are a God send. We use them for just about any kind of clean up you can think of… no water to wash up you hands … use a wipe… no water to clean a minor cut…use a wipe… need to clean a surface to cook on… use a wipe. They are easy to store, nice and moist, stay wet for years in their own container, cheap and portable. I recommend that every one have several containers stored away for a situation like this. We store around 4 large containers of these in the even that we need to wash up with no water. Tip #6 Never ever toss out those extra paper plates or plastic cups after picnicking season is over. It is a wonderful feeling not to have to boil water and use what little drinking water you have to wash the dishes. So when those store brand foam plates go on sale in the summer by extra… and keep them hidden away somewhere. They can save your family a lot of water when the time comes. I hope this will help remind some one of how much we need to store water in case of an emergence. Water is one of the few things that we all MUST HAVE! There is no way to get around it and so many of us never think about not being able to use the water from our taps in any way. That is what my state is facing as you read this. How prepared are you and should you think a head just a little farther. It could keep you from standing in long lines waiting for the National Guard to get you the water you need to just make that cup of coffee in the morning. 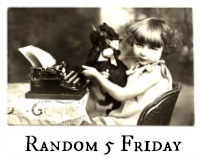 Sharing this post with my friends at A rural journal and Nancy. Hello There. I discovered your blog the usage of msn. That is a very well written article. I will make sure to bookmark it and return to learn extra of your useful information. Thank you for the post. I will definitely comeback. I feel for you and your fellow West Virginians! Safe water is something we cannot take for granted. Great post! Very good tips…we really should get a rain barrel for watering plants if nothing else.